While Tuks flew into a 15-0 lead thanks to an early brace from powerful wing Ciaran Dayaram, they found the affair very different in the second period, when NWU almost battled their way to what would have been a stunning comeback. 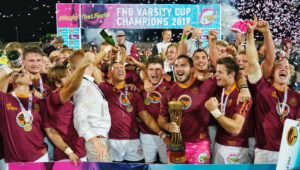 The result sees the Pretoria-based team qualify for their first Varsity Cup final since 2017, and they will face Maties in Stellenbosch. 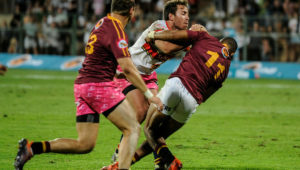 It took just over three minutes for the home side to open the scoring when a maul sucked in the NWU defenders, allowing fullback Vaughen Isaacs to draw and pass to Dayaram, who shrugged off his tackler and reached over for the first try. The hosts got their second minutes later when captain Marius Verwey poached a 5m lineout. A couple of phases later, De Beer put in a perfectly-weighted chip kick, which was gathered by Dayaram for his brace. 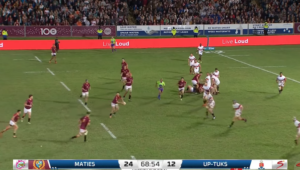 Pukke did not help themselves with a couple of poor handling errors as they tried to get back into the match, while the Tuks halfback pair dominated with the boot. De Beer slotted a penalty to ensure the scoreboard continued to tick over, taking Tuks to a 15-0 lead after 23 minutes. NWU grew into the match as it went on and started seeing more of the ball, but struggled to convert any of their chances. 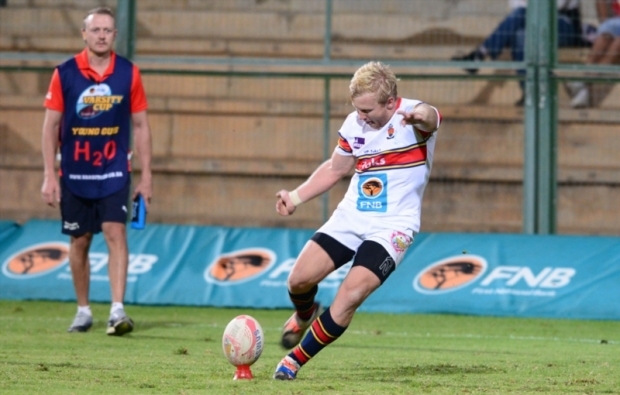 Schalk Hugo kicked a penalty to make sure they got something on the scoreboard, but that was essentially nullified when De Beer kicked his second penalty to make sure Tuks took a 15-point lead into the break. The sides went toe-to-toe at the start of the second half, but the men from Potchefstroom managed to narrow the gap when a quick-tap penalty saw wing Lungelo Gosa cross over in the corner. While Hugo missed the conversion, he did kick his second penalty to make it a seven-point game going into the final 20 minutes of the match. De Beer then kicked his third to take Tuks into a 10-point lead, but that was cut down again when NWU flank Wian Conradie broke through to score their second, with Hugo’s conversion setting up a massive final 10 minutes. 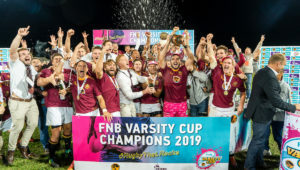 De Beer’s fourth penalty gave Tuks some breathing space in the final five minutes, and while NWU continued to attack well after the hooter, Tuks held out to claim the win. 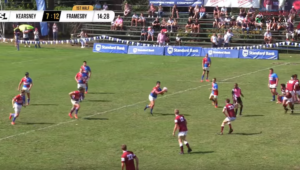 Tuks – Tries: Ciaran Dayaram (2). Conversion: Tinus de Beer. Penalties: De Beer (4). NWU – Tries: Lungelo Gosa, Wian Conradie. Conversion: Schalk Hugo Penalties: Hugo (2). Tuks – 15 Vaughen Isaacs, 14 Irvin Ali, 13 Lourens Pretorius, 12 Erich Cronje, 11 Ciaran Dayaram, 10 Tinus de Beer, 9 Theo Maree, 8 Denzel Hill, 7 Hanru Sirgel, 6 Stephan Smit, 5 Ruan Nortje, 4 Marius Verwey (c), 3 JP Smith, 2 Johan Grobbelaar, 1 Etienne Janeke. Subs: 16 Werner Fourie, 17 Jacobus Eloff, 18 Bart le Roux, 19 Brian Leitch, 20 Reagen Oranje, 21 Damian Bonaparte, 22 Xolisa Guma, 23 Ewart Potgieter. NWU – 15 Shane van Rooyen, 14 Lungelo Gosa, 13 Lincoln Daniels, 12 Evardi Boshoff, 11 Pienaar van Niekerk, 10 Schalk Hugo, 9 Chriswill September, 8 Edmund Rheeder, 7 Wian Conradie, 6 Gideon van der Merwe, 5 Jan du Plooy, 4 Johan Retief, 3 Matimu Manganyi, 2 Louis van der Westhuizen (c), 1 Tshegofatso Moloto.